Rome was built at the confluence of the Etowah and the Oostanaula rivers, forming the Coosa River. 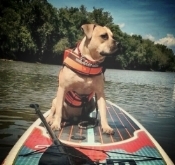 River Dog Paddle Co provides the best way to experience Rome along its rivers on a Stand Up Paddle Board. Our river entry point is a set of steps at the confluence, located a short 2 minute walk from our SUP cabana inside the Beer Garden. If the water is low, we enter the river at the Heritage Park boat ramp, a short walk across the Robert Redden Walking Bridge. The normal paddle route takes us up the Oostanaula River through Downtown Rome to Ridge Ferry Park, 1.5 miles up river. That's followed by a leisurely paddle back down river. At low water levels we recommend a paddle up the Etowah River. We're a stand up paddle board shop. We don't rent kayaks, rafts, tubes, or canoes. We Do NOT provide shuttle service, but can put you in touch with our good friends at River Ratz who may be able to hook you up with a ride, tube, or kayak rental. The Coosa River Basin Initiative also provides several guided paddles throughout the year with canoe and kayak rentals. Beginners must have the strength to paddle up river and be able to swim. Customers with SUP experience can rent and take our boards on their own on our rivers, to the nearby Rocky Mountain Recreation area located 17 miles NW of Downtown Rome, or to the Lake for the weekend. During the warm season, we do a Wednesday night Paddle Club where all experienced paddlers are welcome with their own vessel or can rent a SUP from us. Due to constantly changing water flow and levels on Rome's rivers, we restrict SUP rentals to the age of 16 and up. Want to pick a board and hit the river on your own? Strap a board or two to your vehicle and head to the lake? We can make it happen. You just have to be an experienced paddler to walk or drive away with one of our boards, so we may require a SUP Lesson prior to a rental. Never been on a board before? Tried it once or twice and want some instruction to be a SUP'n badass? Want to perfect your paddling technique? Learn some fancy strokes for a race or perhaps pivot turns to impress your friends? Our certified pros can teach you! SUP Lesson may be required before renting you a board. Contact us for group rates. Want the inside scoop on cool spots along the rivers? Learn some local folklore? Learn how to spot the infamous Etowah Porpoise? We'll hook you up with those in the know who can also give you some basic SUP instruction. We can even fill a cooler with refreshments to enjoy along the tour. Contact us for group rates. Wednesday nights. Meet at the Outpost at 6p, and we get on the water by 6:30. Paddle Club is for experienced paddlers to get out and have a fun social paddle. We paddle. We don't float. We have Paddle Club Rules... No newbies, no kids, no crying, carry your own board, and have fun! Interested in buying a board but want to try one on for size? You can demo a single board or try out a few. Demo fees go toward your board purchase. Headed to the lake house or cabin for the weekend and want to paddle? We can set you up for the weekend. Watch for special SUP Yoga class announcements coming this Summer! Complete an online reservation, call in advance, or swing by to check availability. Day-of rentals at the cabana or over the phone only. Rentals are signed in and out throughout the day unless a reservation is made. Age restriction of 16 and up for rentals due to constantly changing water flow and levels, i.e. Mother Nature.